The yellow fever virus is found mainly in tropical and subtropical regions of Africa and South America. U.S. travelers very rarely are infected with yellow fever, according to the Centers for Disease Control and Prevention. The virus is transmitted by infected mosquitos, and most people do not experience any symptoms or they are very mild. Those who do experience symptoms can have chills, fever, headache, back pain and body aches, nausea and vomiting, and weakness and fatigue. The CDC says that about 15 percent of people develop a more severe form of the disease, which includes high fever, jaundice, bleeding, shock and failure of organs. If you plan to visit one or more of the countries listed below, be sure you have been vaccinated for yellow fever before you leave home. Yellow fever vaccinations and boosters are good for 10 years, per the Centers for Disease Control and Prevention. Confirming that you are suffering from yellow fever can be tricky as the virus symptoms often mimic other diseases like malaria, typhoid, and dengue fever. If you believe you may have yellow fever, make an appointment with a medical professional. The doctor will likely request your travel history, medical history, and take a blood sample for testing. Be prepared to provide a list of any medications you are taking or have recently been taking, including antibiotics, vitamins, or supplements. While there is no cure or prescribed treatment regimen for yellow fever, the symptoms can be worked on while your body's immune system battles the virus. For headache, back pain and body aches, over-the-counter painkillers like ibuprofen can be effective. Drinking lots of fluids, like water and juice, will help to flush out your system and fight dehydration. If at any point the symptoms escalate, head to a hospital for treatment. You may be admitted for monitoring or a higher level of treatment like an IV drip. Should I Get a Vaccination Even If It Is Not Required? "Yellow fever vaccination is recommended for all travelers over 9 months of age in areas where there is evidence of persistent or periodic yellow fever virus transmission." "Yellow fever vaccination is generally not recommended in areas where there is low potential for yellow fever virus exposure (no human cases of yellow fever ever reported and evidence to suggest only low levels of yellow fever virus transmission in the past). However, vaccination might be considered for a small subset of travelers to these areas who are at increased risk of exposure to mosquitoes or are unable to avoid mosquito bites. 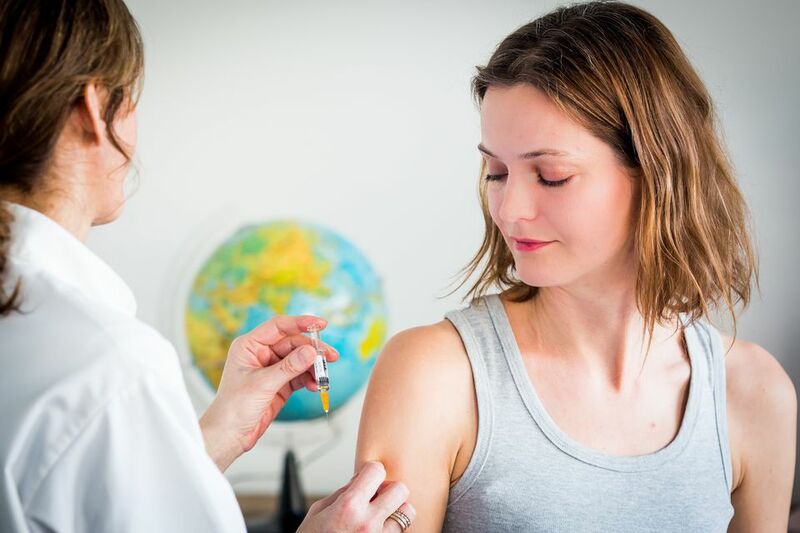 When considering vaccination, any traveler must take into account the risk of being infected with yellow fever virus, country entry requirements, and individual risk factors (e.g., age, immune status) for serious vaccine-associated adverse events." These countries are listed on the World Health Organization's International Travel and Health website as requiring proof of vaccination for yellow fever for all travelers entering the country, including from the U.S., as of November 2018. Check with the WHO site for the latest updates around immunization requirements. Other countries not on this list only require proof of yellow fever vaccination if you are coming from a country with a risk of yellow fever transmission or have been in an airport in any of those countries for longer than 12 hours. Most countries not in the yellow fever zone do not require proof of yellow fever vaccination. Check other countries' requirements on the WHO list. Does My Child Need ID to Fly?